Her fingers were all cut. A few weeks back I got an American Girl Samantha doll to restore. 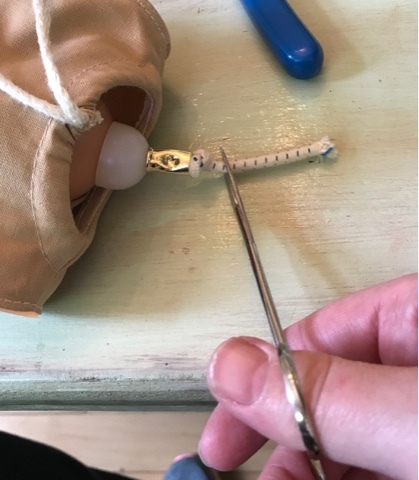 As I mentioned in my eye replacement tutorial, I have resisted learning to restore these dolls because I didn't really see the point. They are so expensive to buy to restore it didn't seem like much profit is left, either. However, further exploration of the custom American Girl restorations showed me if people are getting the prices they are asking it would be worth my time. 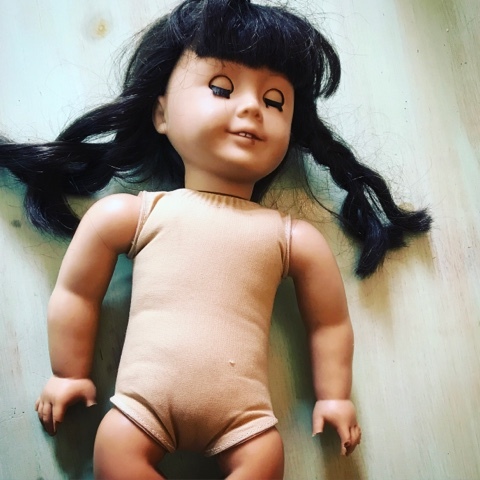 Besides that, I am getting more and more requests for doll repairs in my doll hospital and I know it's only a matter of time before someone wants their American Girl restored. 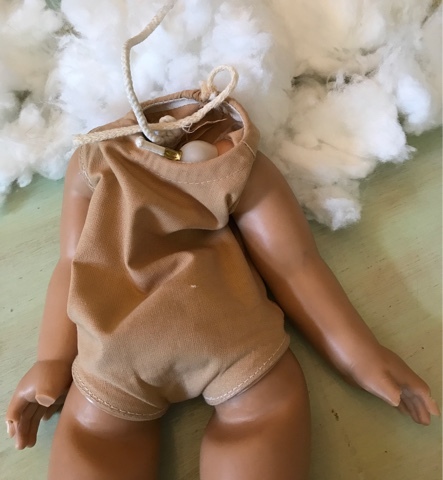 Yesterday I had two different people request to drive to my house to bring their doll for repair. I was up late fixing one of the dolls for a party today. The other doll owner has a problem I can't fix unless she finds certain parts and it's lucky she didn't visit because today she came down with the flu. But anyway, about half my business over the past month has been repairing dolls for people and that's just fine with me because I don't have to pay eBay and Etsy fees. After you remove the head take out the stuffing. 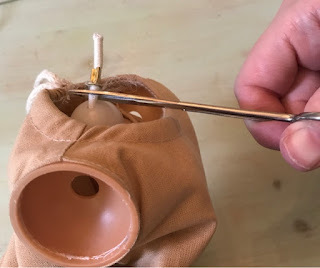 To begin your re-stringing first loosen the drawstring in the neck and remove the doll's head. 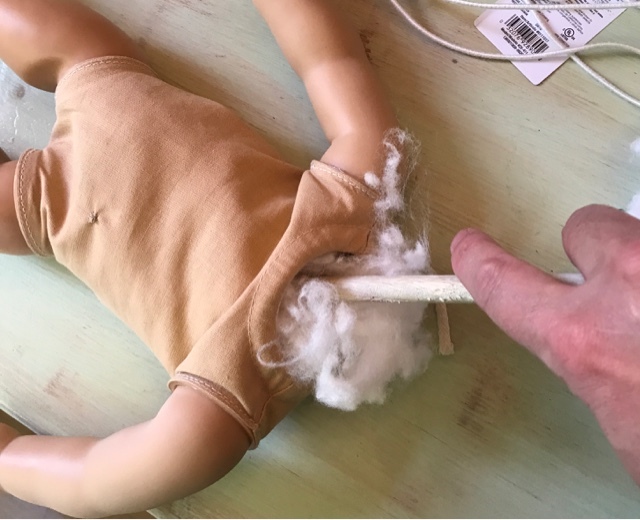 Then remove the stuffing from the doll. Save the stuffing to refill the doll after you're finished with her stringing. The body had a hole. 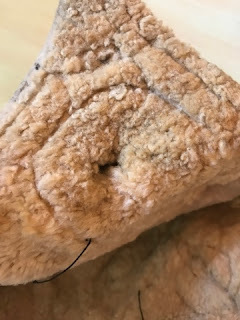 When you have the stuffing removed examine the doll's cloth body to see if there are any holes that need repair. If the body is dirty you can run it through the washing machine at this point. Put in in a pillow case and close the case with a knot or rubber band to protect the limbs from getting marks. Wash in cold water and air dry. 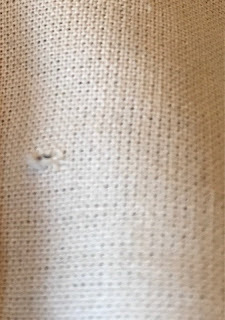 In this case there was a tiny hole which I repaired with a darning stitch. It is more visible than it was before but at least it won't enlarge. 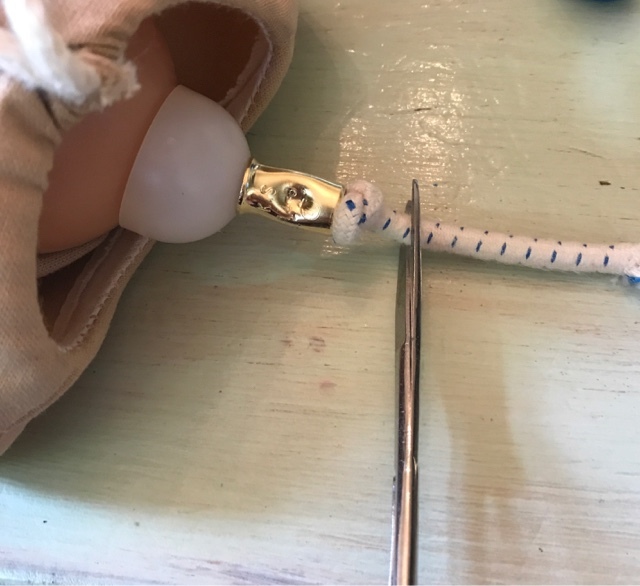 You can use cord scraps for this type of doll. American Girl dolls, like Tomy Kimberly and the Hildegard Gunzel Goetz dolls, are considered "semi-strung" dolls. 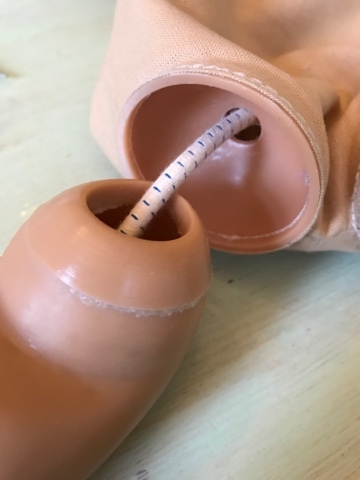 They have stuffed bodies but the arms and legs are attached with cord pulled through a series of cups to create a ball joint for enhanced movement. To re-string the doll or replace limbs you will need the cups that came in the doll, metal ferrules, and stringing cord. 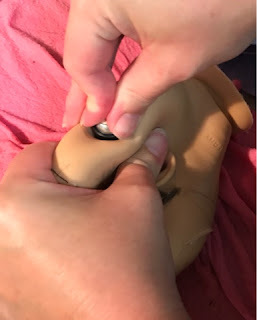 The ferrules aren't absolutely necessary but they do keep the doll from loosening up too soon. 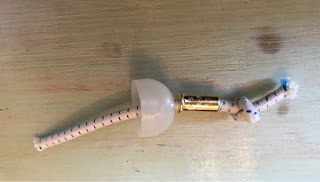 I couldn't find ferrules small enough for the American Girl so I am using larger ones and also larger stringing cord. 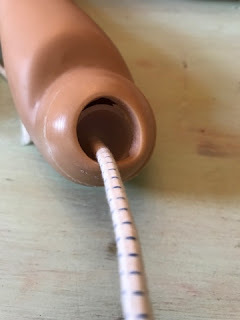 The AG doll uses 1/8 inch sized cord but I am using a larger size, probably about 1/4 inch. 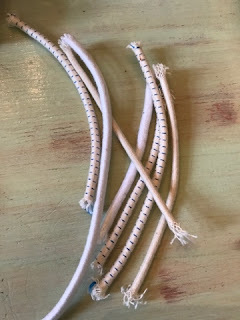 I validated my hoarding today because I used up a lot of scraps of cord I save from other stringing jobs. 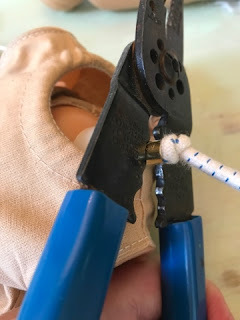 You only need about a 4 inch piece of cord for each limb so it's terrific for using small scraps. If the little plastic cups are missing from your doll I suggest you go to the hardware store and look around for a replacement. I once saw someone use ping pong balls cut in half and metal washers as a replacement, but this doll has replacement cups from a previous repair that are just the right size, only a different color, so the previous owner must have found them somewhere. 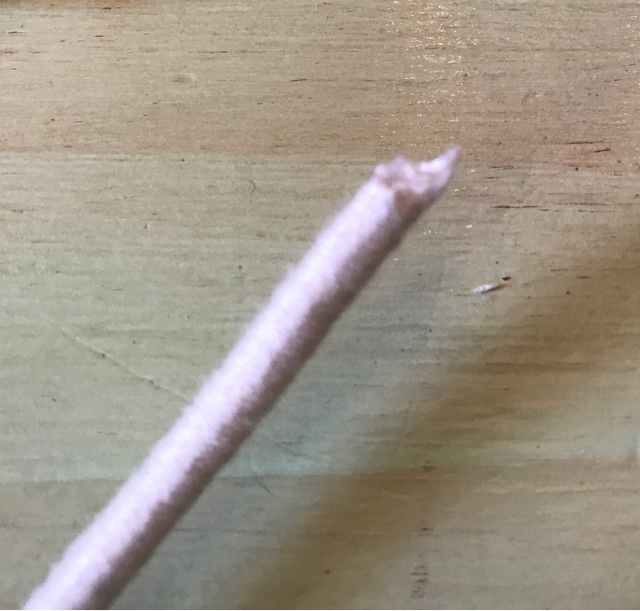 Cut the cord under the ferrule. Remove the cup from the arm. To remove the arm or leg you need to cut the cord under the ferrule, above the plastic cup. Then pull the string out. Remove the cup from inside the arm or leg by pulling it out with pliers. If the cup is stuck inside the limb, heat the vinyl with a hair dryer until it becomes pliable. 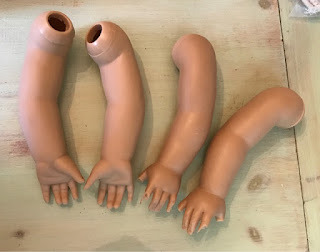 Find new limbs if they need replacement. 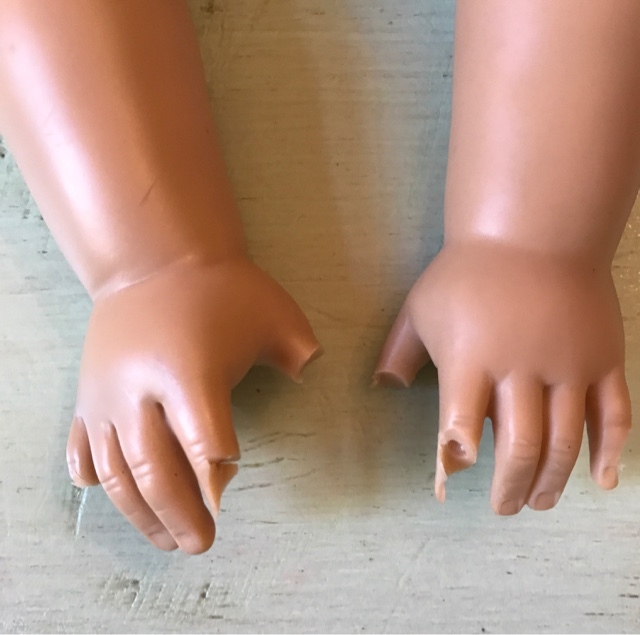 If your doll has damaged limbs, not just loose limbs, you will need to find new ones. 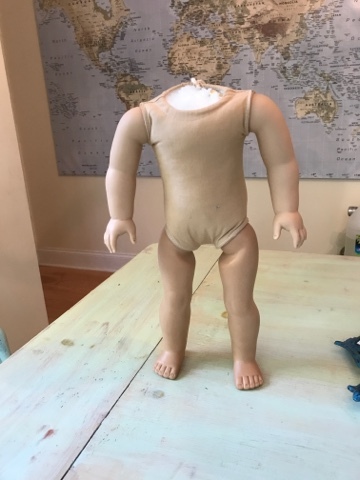 You can order a broken doll for the limbs or sometimes you can just find the limbs on sites like eBay. I got some new arms for Samantha. Cut the larger cord in a point to get it through the cup. Thread the pieces as shown. To attach the limb cut a piece of cord or find a scrap 4-6 inches long. 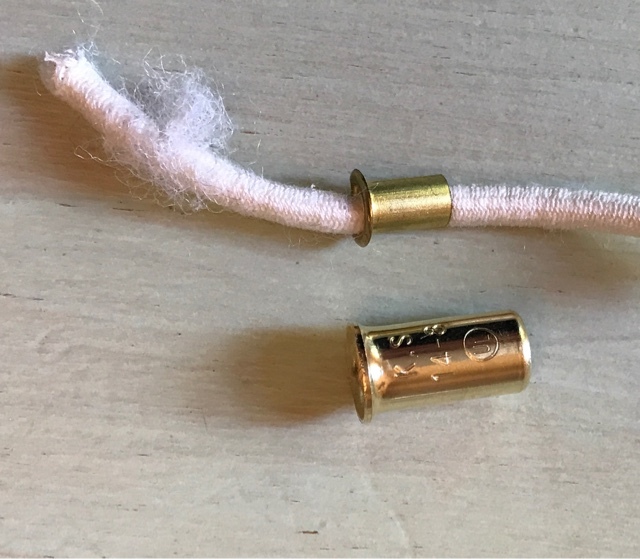 Tie knot at one end, then thread on the ferrule, then thread on the cup. If the larger elastic is too wide to fit through the cup cut the end in a point so it is easier to insert it. When the pieces are arranged as shown above crimp the ferrule. You can use a wire cutting tool to do this. These tools typically can cut, strip, and crimp wire. You can find these in the electrical section of a hardware store. Try to get the crimp tight enough the cord will not pull through. If it lets the cord slide through some it is okay; you have knotted the cord so it won't go all the way through the cup. The ferrule isn't even absolutely necessary. Its purpose is to make the repair last longer before it loosens up. If you can't find a ferrule just skip that step and use the knot and cup. Insert the cord into the limb. 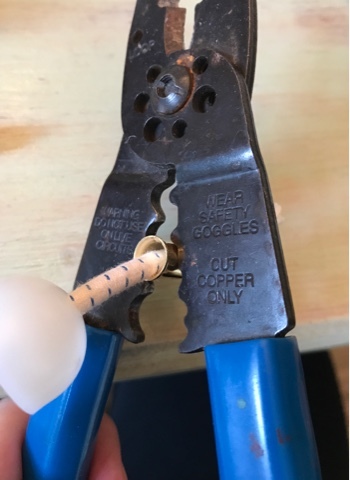 Once you've crimped the ferrule insert the cord and pieces back into the limb so the inside of the cup is facing out as shown. 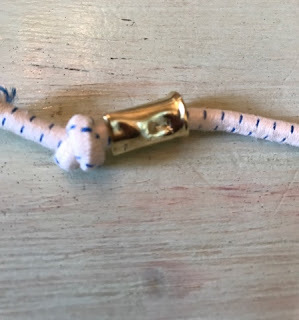 This "closes" the limb and keeps the repair neat and stable. If it is hard to insert the cup heat the limb again with the hair dryer. Insert the cord into the body. Now insert the free end of the cord into the body as shown. 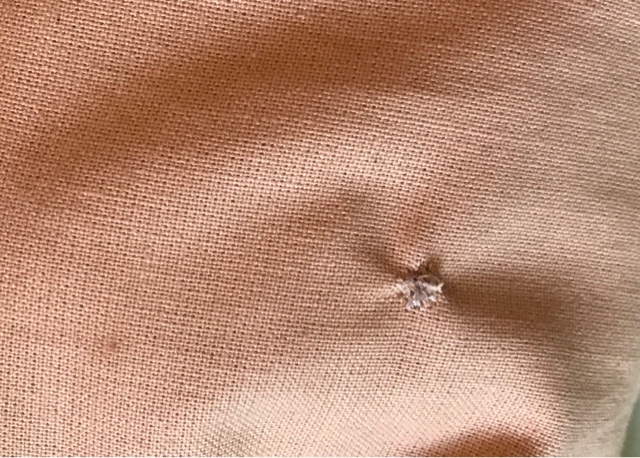 Go through the little hole in the hip or shoulder. 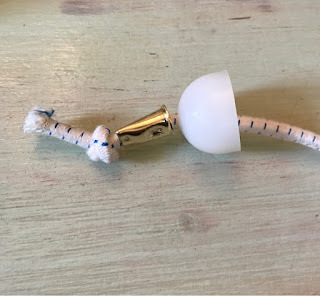 Thread a cup and then a ferrule onto the free end of the cord inside the body. I face the open end of the cup inside the body toward the limb. Thread on the cup and ferrule. Pull the cord tight. 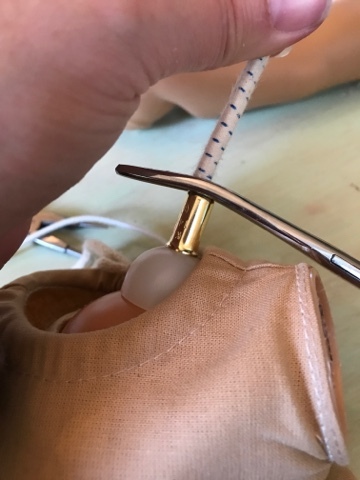 With the cup and ferrule threaded on inside the body pull the cord as tight as you possibly can. Hold the cord taut with a hemostat. Crimp the ferrule and tie the end of the cord in a knot BEFORE you release the hemostat. Move the limb around in the socket to make sure it feels tight and then release the hemostat. 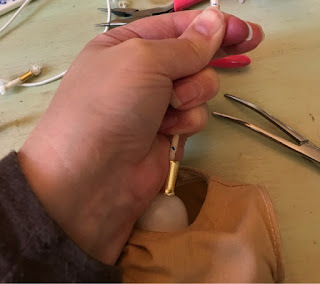 I sell hemostats in my Etsy shop but if you have locking pliers you can use those instead. You will need something to hold the cord tight, however, while you use your hands to crimp and tie the knot. If the limb feels tight enough cut off the excess cord. Stuff the body using the stuffing you saved. Start by poking the stuffing around the leg joints using small handfuls at a time. A wooden spoon handle works well to get the stuffing down into those small places. Shape the body as you stuff it, adding more to the rear end and chest so it looks realistic. If your head is ready you can insert it into the neck hole and tie the drawstring. My head is awaiting a repaint and wig, so I am not replacing it at this time. 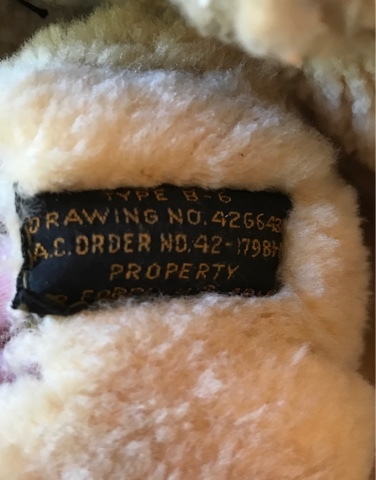 I plan to list some cord and ferrules in my shops and the restored doll will also be for sale when she is finished so please watch. You can link to all my shops from ateliermandaline.com. Stay tuned for the rest of Samantha's restoration. Recently my parents bought a furnished house as an investment and it was full of stuff no one in the family wanted, so they have been cleaning it out. They were kind enough to bring me some stuff they thought I might be able to sell to help out with all our kids' recent medical bills. 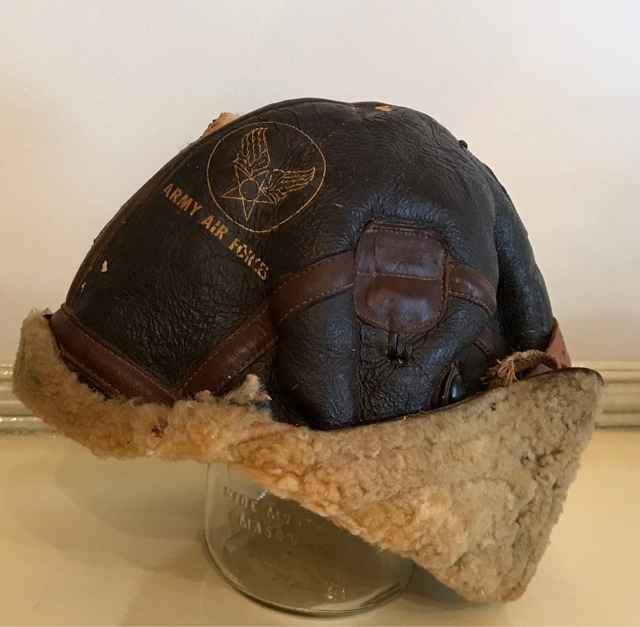 Among the items they brought to me was this World War II B-6 bomber hat. 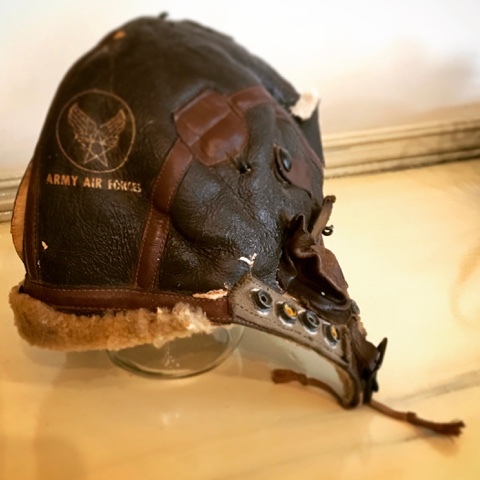 The hat is so old it was part of the Army Air Forces uniform, the precursor to the modern Air Force. 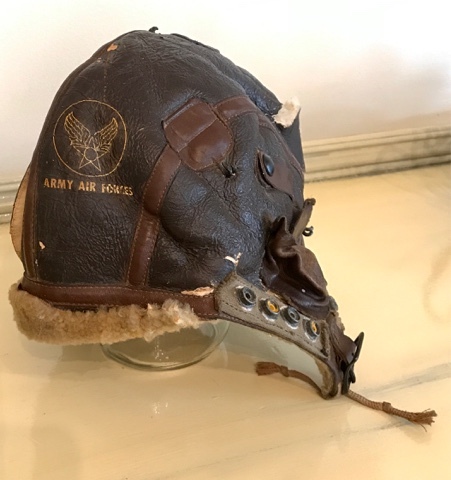 I did some research and this is one of the most desirable and valuable pieces collectors want, so naturally this one is in horrible condition. 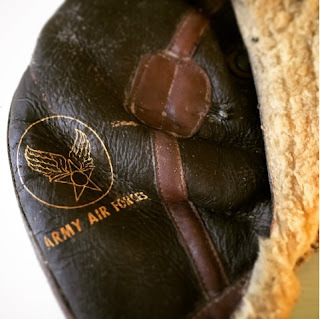 Most of the stuff my parents had to clean out was stored in the home's basement. The house is in a flood-prone area, and the basement is damp, so it is not an optimal storage environment. The leather and shearling were covered in dust and mold and the hat, to be frank, is rotting. When I unbuckled the chin strap, which was pulled across the back of the hat as it was stored, a big chunk of leather fell off underneath it. 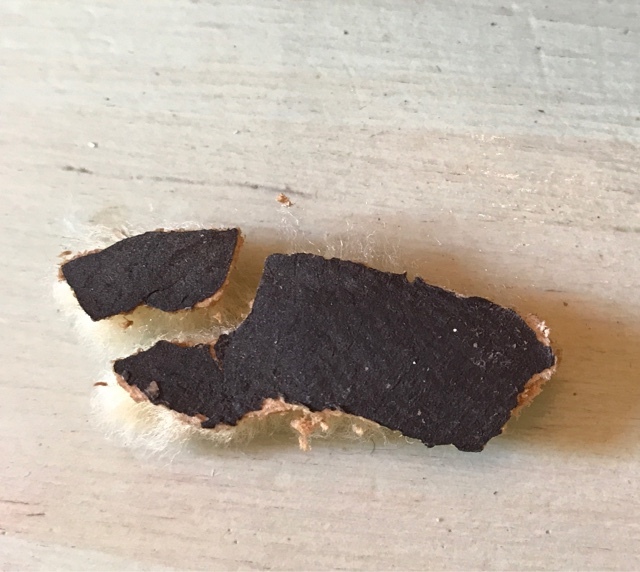 I saved the piece in case there's something a restorer can do. 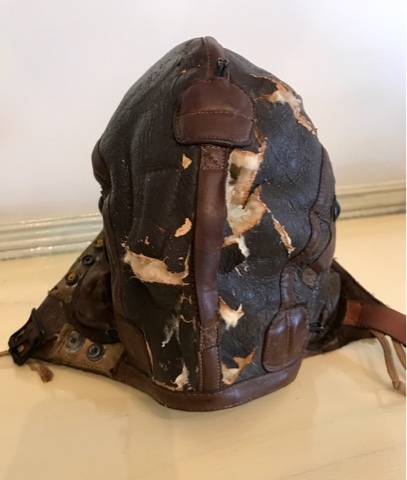 I didn't want to do anything to the hat and further decrease its value but every time I touched it little flakes of shearling or leather came off, so I had to do something to stabilize it. My mom was thinking we should just throw it away, but it's so cool I didn't want to. The flaps have pockets to hold the headphones. 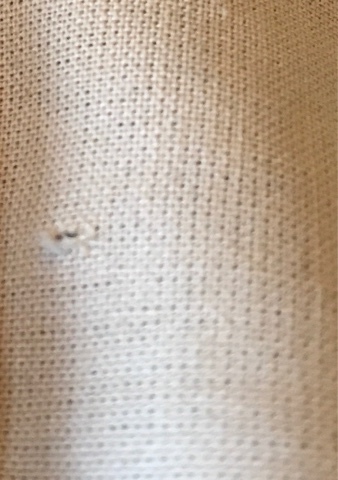 The hole is where the headphone wire went through. 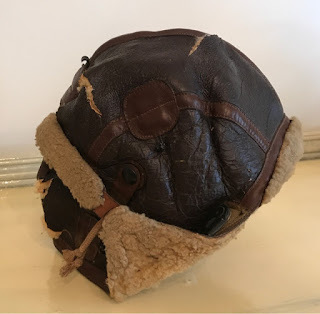 The hat is size Large. 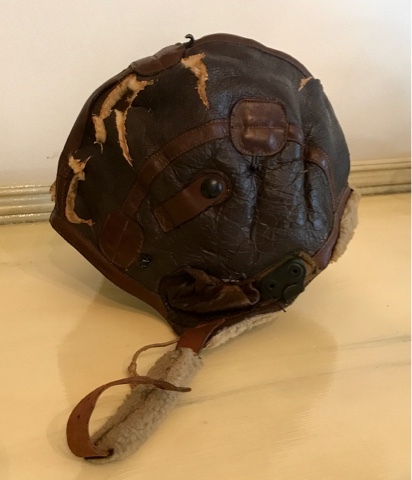 The hat has ear flaps with leather pockets to hold headphones. 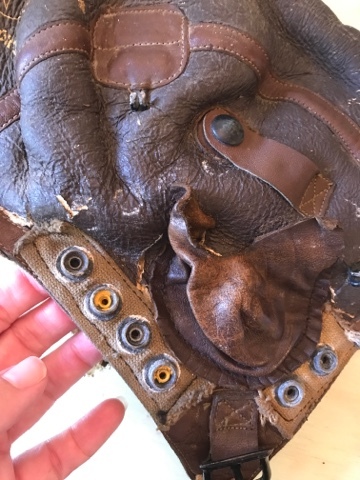 There is a little hole inside the hat for the wires to go through. It's a Large and you can see the B-6 and size labels are in perfect condition. I did some research and most sites warn not to use any modern conditioners with silicone. I got out the vintage shoe shine kit that belonged to my grandpa to see if there was anything I could use. Most of the solutions in the kit have been replaced with modern ones and they don't say whether they have silicone or not. 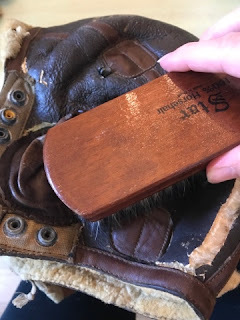 I thought I would just brush off the hat with the horsehair brush in the kit. I brushed off the dirt. 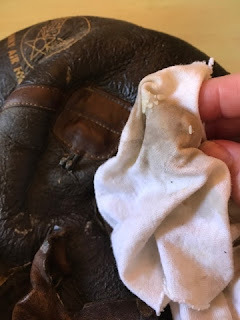 I brushed off the dirt and then wiped the entire hat with a damp cloth, very gently. 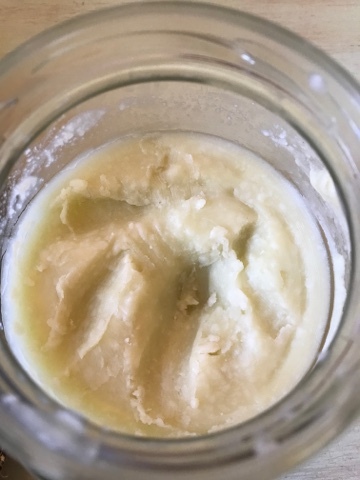 I looked up do it yourself leather creams on Pinterest and it didn't disappoint but I saw they were all pretty much the same ingredients as the wood polish I make to seal my handpainted matryoshka doll sets: beeswax and olive oil with some lime essential oil for fragrance. So I tried the polish on a tiny spot in the back of the hat. I let the spot dry. 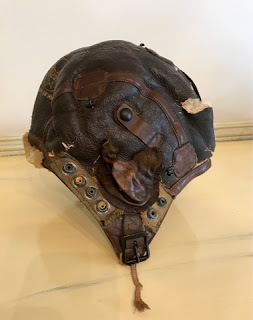 The leather on the body of the hat looked much smoother and the leather on the little reinforcement areas, like the seams and ear flaps became smooth and shiny. I decided to treat the whole hat. Working in small areas, about two inches square, I rubbed the polish in very carefully. 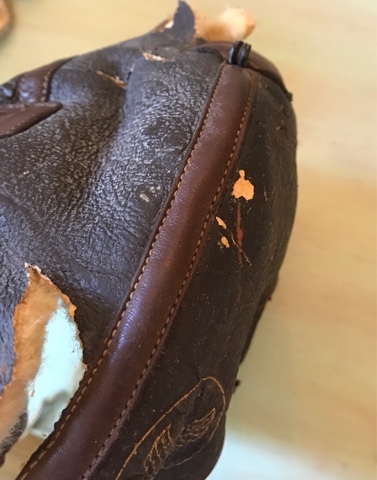 I noticed it cleans the leather as well as treats it. The cloth was black with grime by the time I finished. I was careful to avoid the printed Army Air Forces insignia. The hat turned out looking and feeling much better. 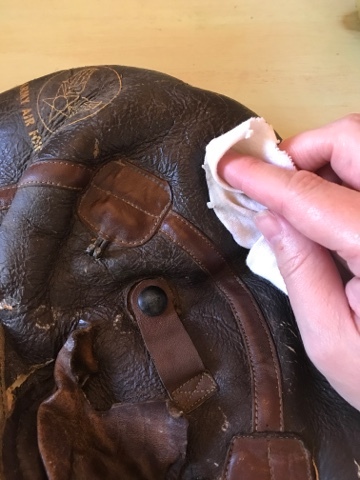 Now you can touch it without the leather flaking off. 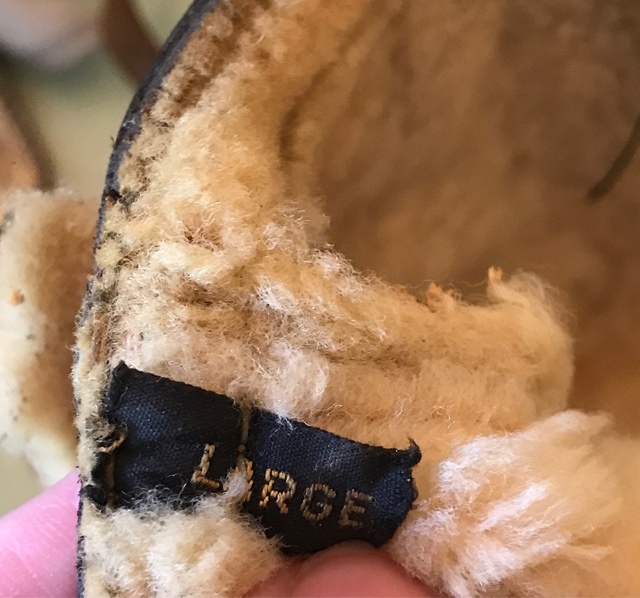 The shearling is still extremely fragile. I figure someone might want to display the hat, as it is really neat looking, or they may even be able to find a restorer to repair the holes, so I have this up for auction in my eBay store. Besides this, I have a lot more loot from the house listed or on the way. 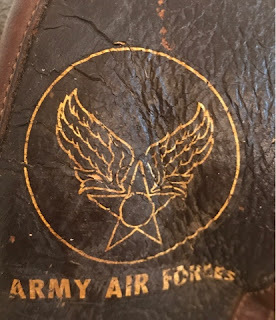 It's mostly Midcentury stuff for men, including gold cufflinks, car or bike parts, and Stetson hats, so if you want great unique men's gifts you'll want to check it out. There are also some wine accessories, Hallmark Keepsake ornaments, etc. The Army Air Forces was the precursor to the modern Air Force. Normally I would not recommend you try to treat vintage leather, as that can decrease its value. 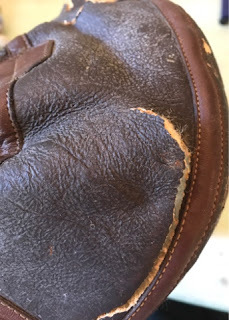 Most sites warn about removing the charming "patina". There wasn't much worry about that in this case; there's plenty of patina to spare! 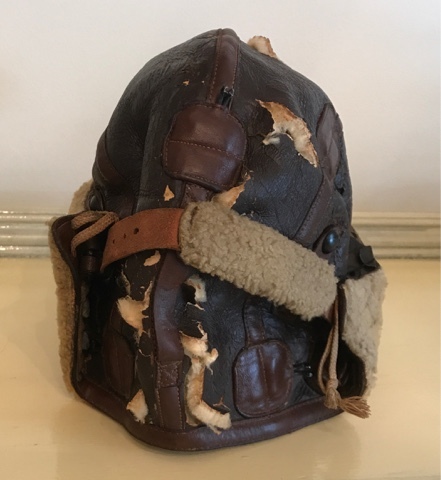 If I felt like the hat would have survived shipping without treatment I would have left it as it was. I have no problems recommending the wood polish recipe as a leather polish, however, for modern leather. It worked really well and it's economical, all natural, and easy to make. I've been getting a lot of work done the past couple days because I can't exercise right now. Four years ago or so I tripped while running. I didn't fall down but I did something to my foot. At the time it didn't seem like a big deal but it was a while before I could run again and still every so often it really starts to hurt. The other day, for no apparent reason, it acted up while I was at the grocery store. I couldn't put any weight on it at all and had to limp out of Food Lion like Quasimodo. Therefore I'm taking it easy, working mainly from my posterior. 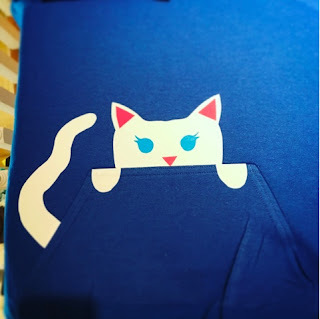 My daughter's birthday is coming up and she specifically asked for an oversized hooded sweatshirt. She stole one I made for her big brother and I made her return it so she wants one of her own. She's a future crazy cat lady so I hand cut flocked vinyl scraps to make it look like the kangaroo pocket has a cat in it. This has been popular on social media, so I will probably design a few for my stores. Instead of hand-cutting them as I did here, I will design some for my machine so they're all uniform. We did end up getting a puppy when we went to look a few weeks ago, a Huskimo (Husky and Eskimo Spitz) named Loki. He and our other dog were sick but are now recovering, but he needs a lot of attention like all babies, so I am behind on my blogging! 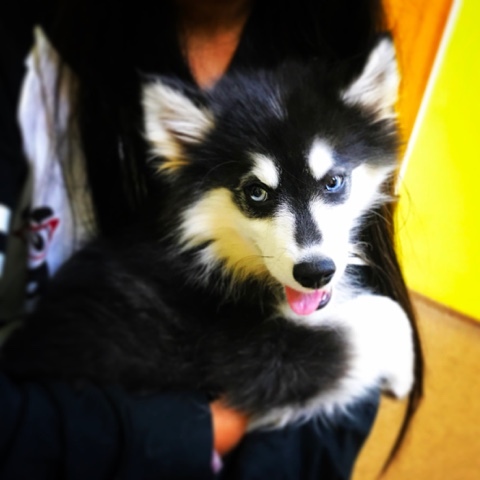 Maybe cute little Loki will make it onto a sweatshirt! 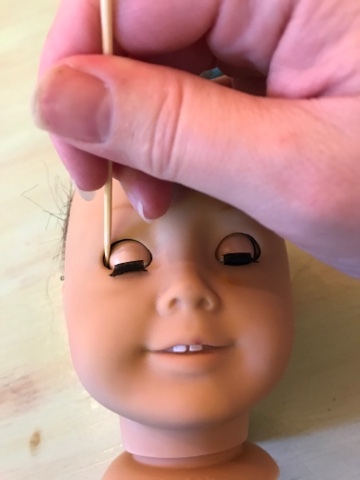 UPDATE: I have succeeded in getting perfectly-fitting eyes made for American Girl and similar dolls and created a new tutorial for you. You can see how to eye swap and buy my custom eyes from my website. 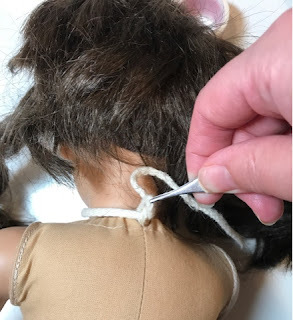 I finally got around to ordering a broken American Girl doll so I can make some tutorials on how to restore them. 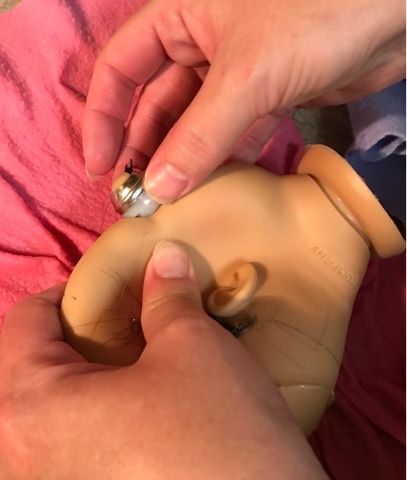 I thought it wasn't worthwhile to learn this doll because, after all, you can send your doll to American Girl's own hospitals and you can order customized dolls. However, the number of inquiries I am getting tells me there's a lot of interest so I decided to learn. Today I replaced an American Girl doll's eyes. This post shows the sleep eye replacement in the 18 inch dolls; for fixed eye dolls like Wellie Wishers view that tutorial. I have been hesitant to recommend a size for the American Girl dolls because I carry Margon sleep eyes, but in the face of absolutely enormous demand I decided to size them myself. Margon is the brand used in most of the vintage dolls I restore. American Girl dolls are like Chatty Cathy and some other dolls whose eyes are specially made just for them. The Margon and other sleep eye brands can be used but they aren't a perfect fit. They are more round than the original oval-shaped eyes. 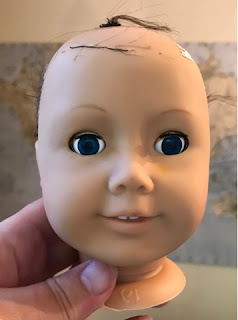 If possible you will want to find original American Girl eyes. These are quite expensive, however, so many people like to order replacements of other brands. In the eyes I carry, the Margon brand, the 13mm size fits the 18 inch American Girl. When you measure the eye it looks like it takes a 14 or 15mm eye but the case on those sizes is too large and round to fit. You can buy Margon 13mm eyes from the eBay link on my website and you can custom-order them painted as you want from the Etsy link. Recently I've had several customers decide the eyes are too small just by looking at them when they arrive. I tell them I will exchange them for the 14mm size, but past buyers told me the 14mm are too large and the casing breaks apart when they try to insert the eyes. So I only recommend the 13mm. I am trying to have better-fitting eyes made to my specifications but I've been having trouble finding a trustworthy manufacturer. Stay tuned because I will update this post when I get them made. Once you have your replacement eyes go ahead and start by removing the head. To do this you untie the drawstring at the neck, loosen the neck opening, and remove the head. You will remove the eyes by popping them out of the socket and to do so you need to get the vinyl soft. You can heat the head with a blow dryer but it is faster to boil the head. If you need to remove the doll's wig boiling the head will help with that as well. 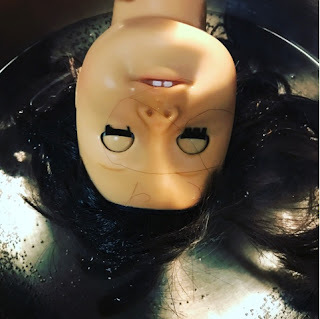 It's important to note that boiling can remove the doll's original hairstyle and can possibly damage the face paint or bring out old stains in the vinyl. Therefore, you will want to consider whether you want to risk damage to a doll by boiling it just to change the eyes. If nothing else is wrong with your doll you will want to consider the hair dryer rather than boiling to heat the vinyl. I saw one tutorial in which the doll's head was covered with a plastic bag before heating. That's a good idea you might want to try if you want to keep the doll's hair nice! Boil the head until the vinyl is soft. It only takes a few minutes to soften the vinyl. You don't want to melt the doll, so check it after 3-5 minutes to see if it is soft. If not boil it a few minutes more and check again. When the vinyl is easily pliable when you squeeze the face it is ready. Don't get burned! 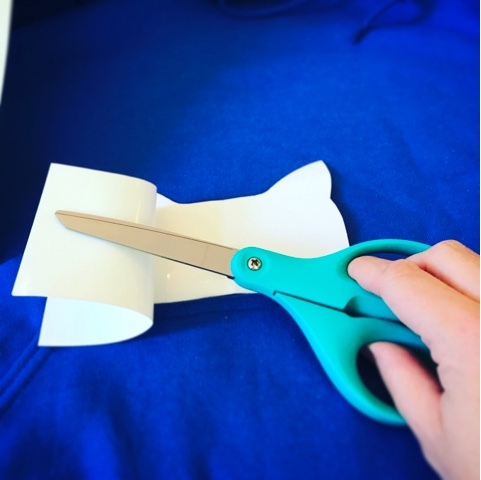 Use a heat resistant glove or pot holder until the vinyl cools enough to touch. Squeeze the face around the eye until the eye pops out of the head. Squeeze the face and pull on the eye. The eye will pop out. 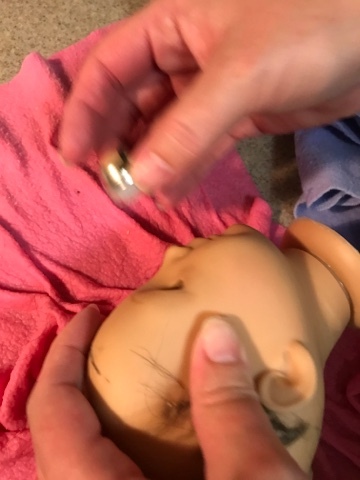 Dry your doll's eye sockets with a towel. When the sockets are dry but the face is still warm and pliable insert the new eyes. To insert the eyes you first squeeze the face around the eye socket as you did to remove the eyes. 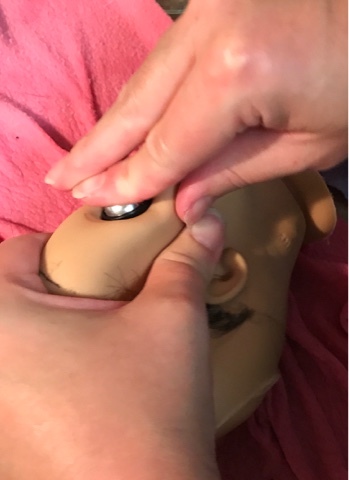 Squeeze the socket open wide and press the new eyes into place. It takes strong hands and patience, but the eyes will pop back into the socket. Try to press most on the frame around the eye rather than the iris or the eyelid to make sure the eyes will still function once you get them in. Squeeze the eye socket open. Press the eye in place. The eye will probably be a little wonky when it goes in, so straighten it out by pressing gently against the frame with a bamboo skewer or similar tool. Straighten out the eye with a skewer. When the eyes are straight and you confirm they are opening and closing properly you can replace the head on the body. You just insert the head back into the neck hole and re-tie the drawstring. Sometimes the metal frame around the eye is still slightly visible when you insert the eyes (although I haven't noticed it anymore than the original eyes, which also show at the edges). You can paint the silver frame to match the skin either before or after insertion with artist's oil or acrylic paints. It's probably most durable to paint the frames after insertion. The particular doll needs wig replacement, re-painting, re-stringing: the whole nine yards, so I will make tutorials all along the way. Check back for those. When the doll is finished she will be for sale, so make sure to check my stores for her.